The children of Reception have used their own words to put together a short piece about 'A day in the life of Reception' through their own eyes. "When we come to school, we play outside until the big whistle goes. We line up and then walk into our classroom. The first person has to hold the gate and everyone should say thank you. Because we are big, we don’t need our Mummy or Daddy to help us put our coat on our peg. We have to remember to put our snack in our tray and get our reading books out. We sit on the carpet with our magic-5 and see if the teachers think we are ready to learn. I’m always ready to learn because I want my brain to grow. Our teacher wakes up the register and sometimes Flora is asleep too. She sometimes plays with our toys during the night when we are at home. We look at the challenges and then see what’s best to do and then do them. I liked the days of the week challenge and writing silly sentences. If we work really hard, then we get our lolly stick for our rainbow challenge. If we get them all, we can have golden time on Friday. At playtime we go outside while our teacher has a rest. I don’t think she lies down but she has a cup of tea and eats food! I like playing police at playtime. The police cheaters help the police know where the badies are. After break, we do phonics with phonics fox. There are a lot of sounds to learn. Do you know a diagraph is 2 letters that make one sound? Some of the sounds are naughty, like word it sounds like it should be w-u-r-d! We love lunch! There’s a salad bar and you have to eat up all your dinner. Mrs Bailey is a good cook. In the afternoon, we do lots of different things. We always do our meditation first. I fall asleep and smudge my face. Today we are making dinosaur meringues. We have made planet pizzas and soup. I liked our biscuits but mine was a bit burnt! We do more challenges in the classroom and build great big train tracks. I like painting and there is lots of colours. Mrs Manson looks after us with Miss Frankland and Miss Sutton. At home time, we pack our bags, we don’t need help and sit on the carpet. If we have moved up to outstanding behaviour we get a little treat before we go home. I love, love, love Reception! It’s fun, fun, fun! I know all my letters now and I can count to 20 and count back again without looking at the number line. As you can see it’s very busy in Reception, no wonder I need a rest at break time!" 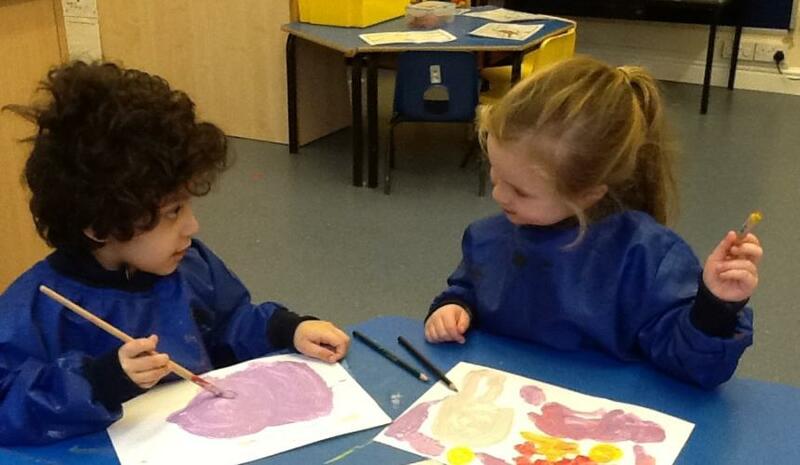 See some pictures of 'A day in the life of Reception' in our photo gallery.